Whether it's the literal or moral sensibility to one of Aesop's fables; the glitter that once shown on gold, then Apple and is now caked on the SPX - traces its DNA origins to the same benevolent hand of the Fed. And although I don't blame the Chairman for creatively utilizing the structural and psychological tools he was provided to address the considerable deflationary tide at the time, I fear the limitations of those implements are starting to become apparent as his monetary mettle and theory face another crucial test. While it would be favorable for the moment to believe that the financial system is a "closed" construct at the will of the Fed, the truth is it likely resides much closer to "open" - with the considerable balance of growth, or lack there of - spread across the developed and emergent world. While the recent data reflects the US to be the best dressed ugly duckling at the party right now - there's enough signatures in the market to believe this reflationary road we have been on since 2009 is coming to an end. As the Paul Krugram's of the world ruminate (see Here) over why we haven't seen deflation (as if it's already in the rear view mirror), it begs the question if an economist's perspective is once again the great contrarian cue for investors. While the inflation data has certainly been moving towards the disinflationary side of the continuum - the prospects of another more worrisome deflationary scare appears to be on the horizon once again. The chart below is an updated version of an inflation/reflation concept that I had introduced back in October of last year (see Here), that is expressed through a long-term moving average of the silver:gold ratio. 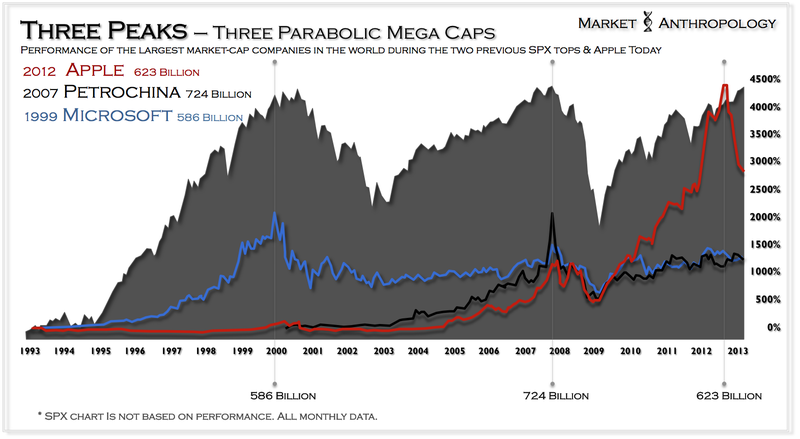 To make a long story short - it depicts (in a remarkably conforming pattern) the funneling of asset inflations and reflations over the past two decades. Although the ratio is smoothed and lagged by its long-term moving average, it frames an inflation expectations and monetary policy narrative, that since the savings and loan crisis has been working towards a narrowing resolution. As evident in the chart, from 1994 to the arrival at ZIRP in 2008 - the Fed primarily relied upon the federal funds rate to guide and persuade inflation expectations. Once the fed funds rate arrived at zero bound - it has primarily attempted to rekindle expectations through subsequent rounds of quantitative easings. The bottom rail of support in the pattern is defined by these rate hikes and risk persuasions through subsequent rounds of QE. 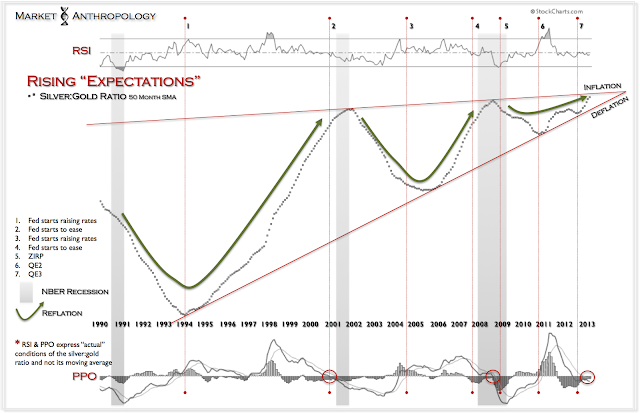 As expressed in the chart, each reflationary drive between recessions has become narrower and less dynamic as the Fed's monetary and persuasive toolbox is depleted. If past is prologue, we are at a point in the cycle where we typically awake one morning to find that the equity markets have exhausted their reflationary drive and the economy is slipping or has already moved into recession. What complicates matters, is while the two previous downturns were primarily endogenously spawned - the anticipated third drive lower will likely emanate from overseas. Whether Bernanke has a few more creative monetary measures up his sleeve is anyones guess, but he appears to be working as he has in the past - in coordination (i.e. 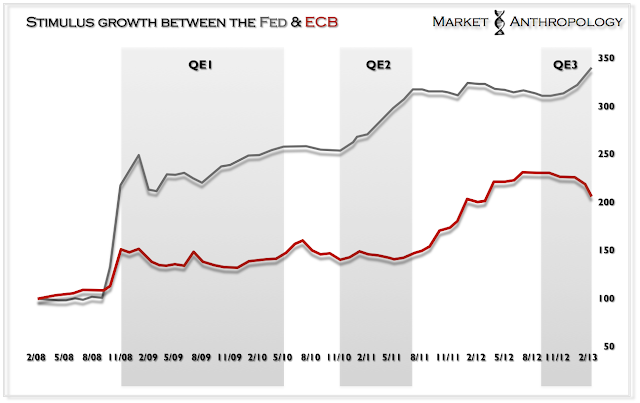 the Fed stimulates & the ECB constricts) with the ECB. Unfortunately, and as we have expressed in our own market expectations and postures - the monetary elixar appears to be neutralized by a shifting currency backdrop that now finds a secular tailwind at the backside of the US dollar and in the face of a flawed and wounded euro. As we have been following over the past few months in our Connecting the Dots series - the silver:gold ratio's performance spread (as measured from the start of the secular bear market in March 2000) has now contracted to only .02 bps above the SPX as of yesterday's close. This is the narrowest spread for this reflationary measurement of the equity market rally that began in March 2009. In the past (2000 & 2007), when the silver:gold ratio's performance has "inverted" below the SPX's, this has indicated the start of another cyclical leg lower in the equity markets. Considering underlying monetary conditions and market reflexes have only become more fragile and ephemeral since the bear market first growled in 2000, the belief that the equity markets can overcome these disinflationary conditions and signs of exhaustion - appears unlikely. True to form, the market was strongly repelled at its long-term meridian last Thursday as it closed out the month of February. And although it currently is trading around the hinge at 1542, we suspect it will once again respect resistance with perhaps a topping structure inverse to the equity market lows in 2002 and 2003.